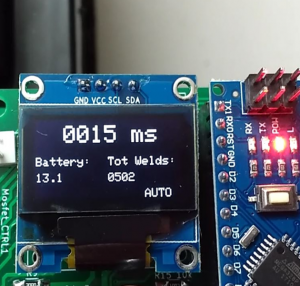 The spot welder V3.2 is capable of using up to 800CCA car batteries as a welding current supply. Do not use a car battery that can deliver more Amps. 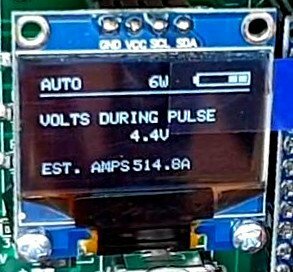 Please note that some car batteries can deliver a bit more Amps as their CCA rating says when used in this application (few ms pulses instead of several thousand ms to start a car). For example a 40Ah 440A (CCA) car battery already works fine to weld 0.1mm to 0.25mm nickel strips to batteries. Please note that V3 with the one big through hole TVS diode on the mosfet board should only be used with 400 … 600 A (CCA) car battery size to work reliable. Higher CCA car batteries can lead to the destruction of the TVS diode. 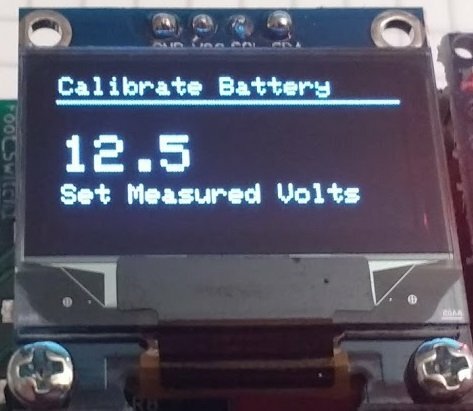 V3.1 and V3.2 with the 4 SMD TVS diodes on the Mosfet Board can handle up to 800CCA car batteries. If you want to use higher currents or longer welding cables you can do this at your own risk. Absolute maximum rating of the IRFB7430 mosfets is about 1400A welding current. Do not connect it wrong way around to the car battery. The U-shaped aluminum part goes to the batteries minus (black) pole. On the first use set the welding time to 3 or 4ms and see how it welds. Then increase the time until you get good welds. If time is set to high, e.g. 20ms for very thin nickel your nickel material will “explode”. 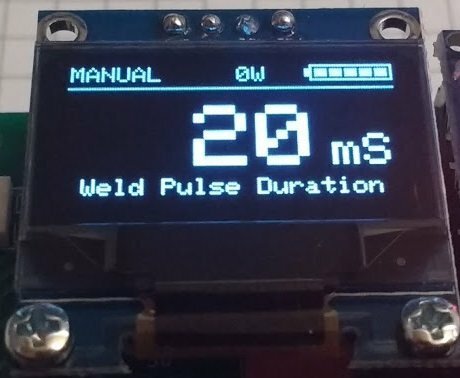 If you dont have a multimeter you can do this: turn on the Spot Welder, switch off the AutoPulse feature, then put a nickel strip on a piece of wood and put one welding tip on the nickel. Then quickly touch the nickel with the other welding tip. If nothing happens you are good. If you burnt a hole in the nickel strip something is wrong. The main screen has a status bar at the top and the weld time setting as big as possible on the rest of the screen. The status bar shows you the weld mode (auto or manual), the total welds that have been done and the battery bar. This feature was introduced with software version 3.2.1 and allows the Spot Welder to measure the voltage drop across the two welding cables and the Spot Welder itself. From that value it then calculates the Amps. 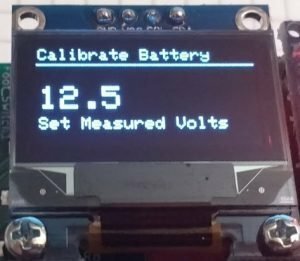 The Amp calculation works with a fixed system resistance value of 9mOhm because it is not possible for the Spot Welder to measure the resistance. This means that the Amp calculation will only be accurate if you are using the original welding cables and place the tips on the nickel strip about 1 cm apart. 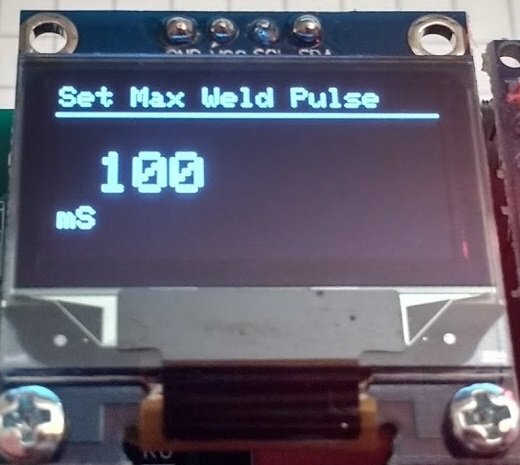 The measurement will be displayed if you hold down the foot switch for more than 2 seconds after a pulse or if you leave the welding tips on the nickel strip for more than 2 seconds after a pulse. 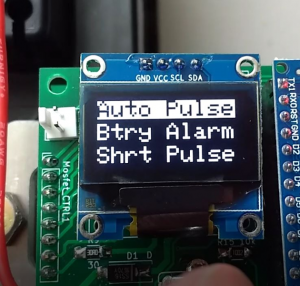 Too leave the measurement screen simply push the rotary encoder button. 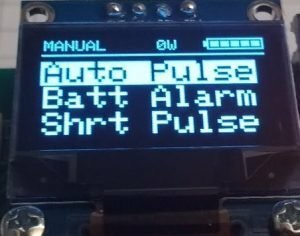 Auto Pulse – switch between the “Auto” or “Manual” mode. 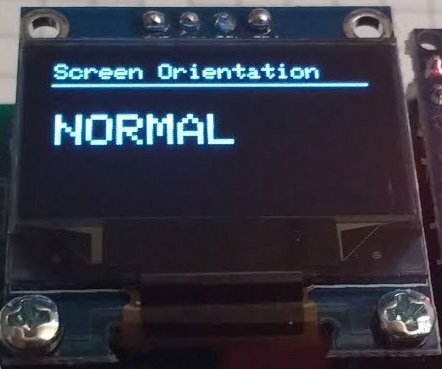 You can only use the foot switch in “manual” mode. 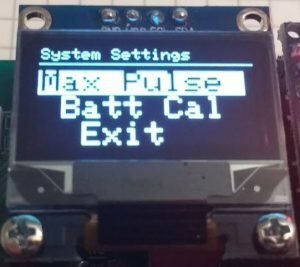 Batt Alarm – set the battery low voltage alarm (default 11.0 V) – this will be the lower limit of the battery bar and the limit to trigger the battery alarm screen. 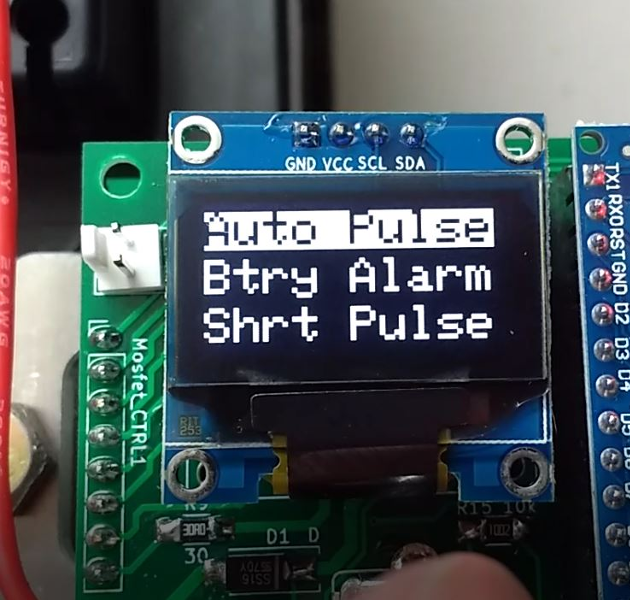 Shrt Pulse – set the short pulse duration (default 12% of the pulse time). The short pulse is meant to preheat and clean the weld Spot before the main pulse happens. You can change it but 12% is usually a good working value. 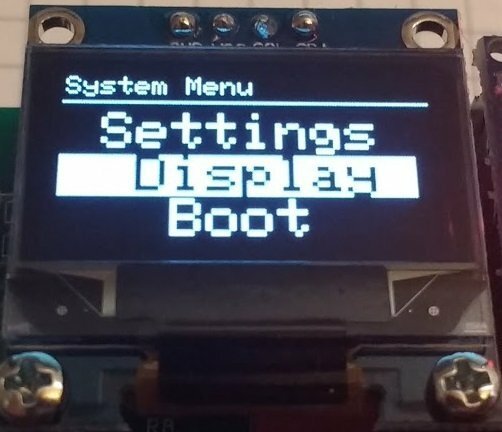 The reboot will only work with Software V3.1 to V3.2.1 and if you do have the “OptiBoot” bootloader flashed to your Arduino Nano. 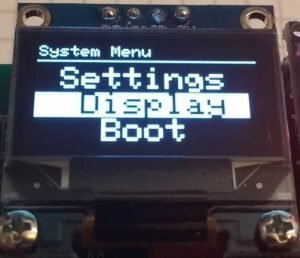 How to do his is shown in the update tutorial. Without the bootloader the Arduino will go to an infinit reboot loop and start blinking. 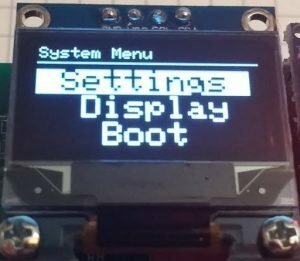 To reboot without the new bootloader simply wait about 5 seconds after you clicked reboot and then unplug power. 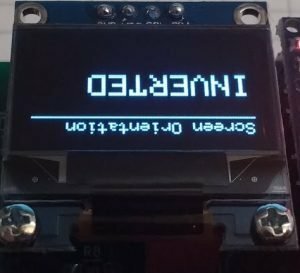 After this power up the Spot Welder without pressing the rotary encoder to enter the normal operation mode (Main Screen). This also applies to the “Safe Reset” and “Full Reset” menu items. 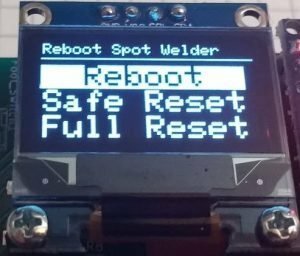 If you adjusted something wrong or want the default values back, you can reset the Spot Welder. 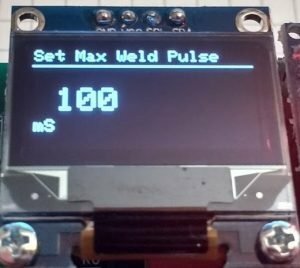 This will reset all settings except the weld counter.